For one thing, it was Leonard Read, not Friedman, who deserves credit for the pencil example. Much more importantly, Rodrik has either never read the essay in question or his reading comprehension is, well, let’s say in the lowest quintile. He evidently thinks Friedman (he means Read, of course) means the production of pencils is evidence of the superiority of markets, since socialist countries couldn’t make pencils. Why he would think anyone would say such a thing is beyond me; you’d think simple intellectual honesty would lead him at least to check out the original essay so he can be sure it’s really as stupid as he’s claiming. The essay is in fact a testament to the miracle of the international division of labor, whereby a simple product like a pencil, which turns out to be enormously complicated when we consider the types of knowledge necessary to assemble one, is nevertheless produced — without surpluses or shortages, and without the need for a Global Pencil Production Planning Board. 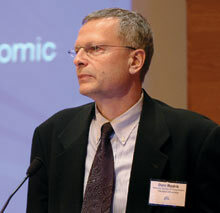 Over at EconomicPolicyJournal.com Robert Wenzel is withering on poor Rodrik, who might consider not being a vicious ignoramus next time he discusses his opponents’ views.